On West 4th Street in New York City, when the weather is decent, you’ll find a yellow tent for Horman’s Best Pickles, bright as a spotlight, propped up near a busy independent movie theater. 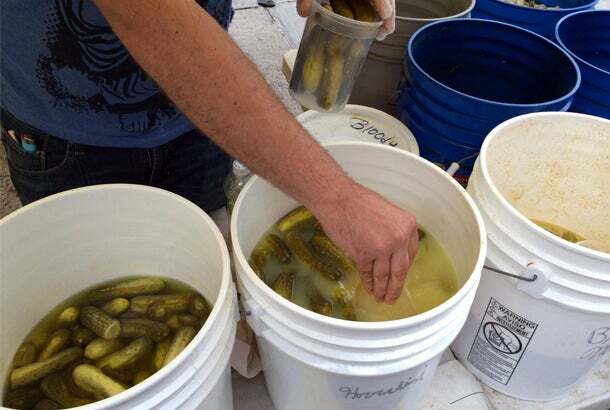 Under that tent, a small crowd gathers to wait their turn as two workers fill up plastic buckets with pickles.These aren’t just the afterthought pickles that come with a sandwich or burger. With flavors like horseradish and brown mustard alongside staples like dill and half-sour, these juicy brined cukes deserve notice not only for their unique method of sale (how many pickle vendors do you know? ), but for their inventive flavors. In many ways, that little tent is proof that even the simplest products require constant innovation to stay fresh. In its earliest days, the pickles were brined in barrels on the cobblestoned streets of old New York and then delivered to delis and luncheonettes around the city. In 1960, the Hormans began operating out of a three-car garage in Glen Cove where they had room for 200 to 300 barrels. At that time, the pickling process was such that pickles that were made in October had to be sold by March to avoid becoming hollowed out. For the rest of the year, according to Horman Sr., companies would sell processed pickles from Michigan that were stored in salt. Refrigeration became a part of the industry in the ‘70s and, a decade later, Horman brought vinegar brine to New York, having heard about its usage in Chicago. Beyond offering a different flavor, the new brine meant that the cucumbers could be shipped in the liquid without the worry that gasses released would ruin the product. This meant wider distribution, and it meant that production would have to increase. The Horman family moved to a new factory, just a mile away from the three-car garage, in 1992. Innovation continued after the move, but as occasionally happens, some new ideas didn’t quite work out. The single-serve pickle tray, a peel-back plastic container for individual pickles that customers could buy off shelves, was one such experiment. Horman Sr. said that the container resembled a coffin, but worse, the flavors of the pickling spices and brine were being absorbed by the tray material. The pickles were left flavorless. The idea came from a client, though later, that same client rejected the end product. The company survived the blunder, which happened in 1998, and has moved forward. Today, it brings in an estimated $800,000 in sales a month and continues to eye new revenue streams.The focus of these new streams is to create an awareness of Horman’s as a brand, rather than a faceless entity behind well-known names. Both father and son are working to get the Horman name “out there”; the company’s revenue mostly comes from private label sales, where the role of Allen Pickle Works and the Hormans themselves is unknown to customers. The pickle stand, then, is just one of many revenue streams. Nick Harmon Jr. began the venture as a college student to earn money during the summer, and didn’t officially join the Allen Pickle Works payroll until 2006. In a typical summer, the stand would bring in about $1,600 in two months. Now, in the West Village, it brings in about $2,500 in each week. Horman credits this to better presentation, more varieties and building a following. Those followers have shown to be pretty devoted. When Horman Jr. was going through a divorce, business fell by the wayside a bit: until recently, the website was out of date and the phone number listed was incorrect. There’s still nothing that informs customers of where and when the tent will be set up. Horman Jr. is easing back in and credits working with family for the ability to step back from work when he needed to. He now has plans to expand the tent to locations in Long Island and the Hamptons. Soon, varieties like the honey mustard pickle and the red flannel pickle (a variation of the bread-and-butter pickle that uses red peppers rather than onions) will be available to wider audiences. It will take time to catch on, however, and Horman Sr. has no problem with this. By his estimation, it takes six or seven months for people to discover a new product on store shelves, three years to break even on a new revenue stream, and a decade before people will ask for a new product by name. As any good pickle man knows, however, it's best to let things sit and marinate for a while. “Me? I can sit and wait,” he says.